Tenly was a very athletic girl who prefered to stay at home. She liked to work but was not comfortable with all of the commotion of dog shows. Unfortunately, she was lame in December, 2014 and diagnosis was osteosarcoma. She passed in January, 2015 at 11 years, 9 months. Georgi had a very outgoing personality and loved to work. 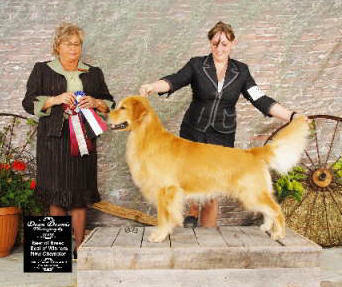 She finished her Canadian championship very quickly over some very stunning dogs! 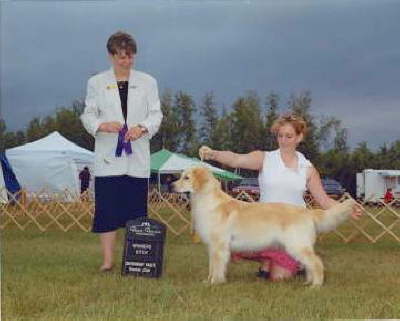 In July, 2009 she was shown in Veterans Sweepstakes at the CVKC show and took Best Veteran. She had her 14th birthday in September, 2014 and was always a very happy, bouncy girl who was very demanding for her breakfast treat! She passed on December 17th, 2014, the day before her daughter, Eva had a litter of 10 puppies. Her legacy will live on in her granddaughters, Billie and Whitney. 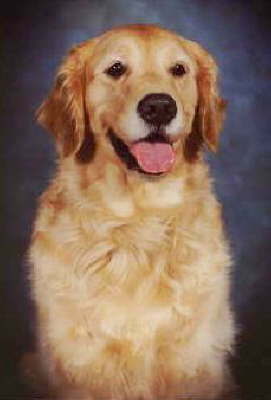 Brady passed away on June 30 2014 at the age of 15 years, 4 1/2 months. His tired old body just gave out. I really miss the old boy. He shared my bed right up to the end. I helped him up on the bed every night and he snuggled close by on his own pillow!. 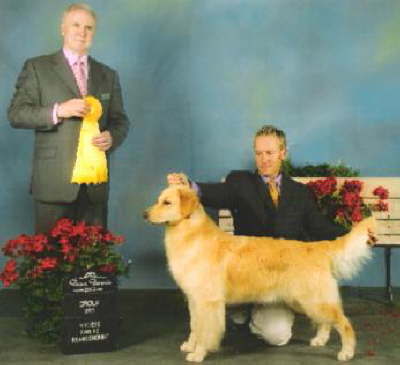 He finished his Canadian championship taking Best of Breed over the Specials and then taking Sporting Group 3! He gave me some wonderful puppies who share his awesome temperament. Layla and McKayla are his great granddaughters! Eva is his daughter and his legacy will also live on through her daughters, Billie and Whitney. Emily was my heart dog, my partner, and my joy. She did everything with enthusiasm and made it clear that you knew about it. She competed in Utility, but never titled because as Frank Sinatra said "I did it my way!" She loved doing the articles. Nothing wrong with her nose! Dancing was one of her favorite sports. 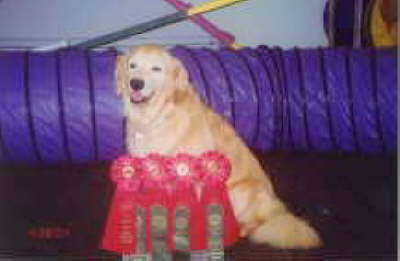 She earned 2 titles in Canine Freestyle and loved doing demos and going to nursing homes. She was my assistant instructor for obedience classes, except when she thought she knew more than me and decided to run the class her way. She always knew which student had the best treats! I really miss that bossy old girl. 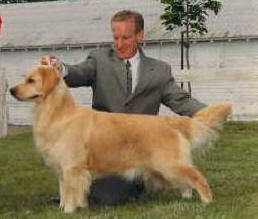 Ethan finished his Canadian Championship at the age of 10 months, taking Best Puppy in Group. (Lost Best Puppy in Show to a really cute Dachshund!) He has completed his CD title and Novice Jumpers and Open Standard agility titles. Very tragically, we lost him 2 days after his 6th birthday to lung torsion. It was discovered in July and he underwent surgery. He was recovering, but had a relapse exactly 1 month later. His legacy lives on in his super sweet daughter, Charo., and her daughters, Layla and McKayla. Elise is a gorgeous, totally correct girl who qualified for her CCA (Certificate of Conformation Assessment) awarded by GRCA in October, 2008 at the age of 12 1/2. Perfect score is 100 and the 3 judges awarded her scores of 90, 90, and 99!!! Not bad for an old girl! Oliver was a very stunning young dog with incredible movement. He had a very happy and outgoing personality and loved to "talk" to people. Unfortunately, 3 bad experiences with unfriendly dogs in the show ring as an 11 month old puppy left him with no love for the breed ring. 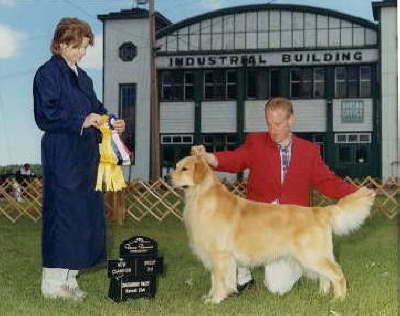 However, when he was the only dog as in obedience, agility, or freestyle, he really shined! 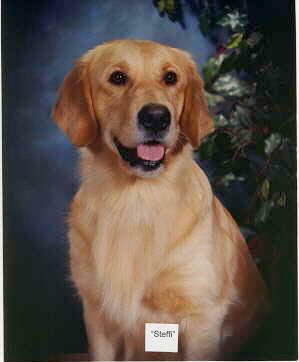 His favorite sport was Canine Freestyle and he loved to "dance to the music"! He has consistently produced outstanding puppies. He passed on his great personality and brains as well as beauty. My heart was broken when I lost him on April 10, 2013, 2 months short of his 8th birthday. He was my heart dog and shadow. I swear he could read my mind! He loved to hold my sleeve or shirt and lead me around the house. Steffi was a very happy outgoing girl who did well when shown as a puppy, but her heart was not really in it. She prefered to be my shadow and get all of the attention she possibly could. Her favorite job was "lap warmer"! Steffi passed away from complications from surgery 3 days before her 13th birthday. I really miss my "Snort Pig", "Snuffleupagus", and lots of other nicknames! She could talk your ear off! I recently acquired her great-grandson and great granddaughter, Brooke and Crosby., who share her loving disposition. Alexis was a very pretty, balanced girl with a great temperament. 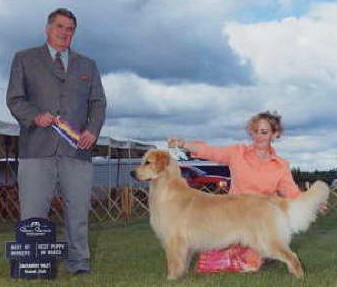 She had 5 points towards her Canadian Championship, but tended to blow coat as soon as summer and show season arrived! Alexis came out of retirement and competed in our Green Mountain Golden Retriever Club match and took home Best in Match! She seemed really happy to be back in the show ring again! Unfortunately, she succumbed to total kidney failure due to Lyme disease. Jeb was a very sweet boy who belonged to my daughter and her family. He absolutely loved "his" 2 kids, Molly and Tucker. 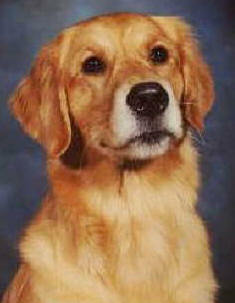 He had the true Golden temperament - anything the kids wanted to do was OK with him! He was diagnosed with Lyme Nephritis in March, 2015. Through diet and supplements, he enjoyed 4 years with his beloved family losing his battle in May, 2015. 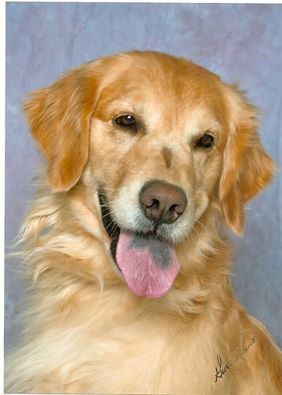 He is sorely missed by Heather, Brent, Molly and Tucker. Madison was a lot like her mother, Georgi. She was very happy with a great disposition! She had beautiful movement and great pigment. Gracie was a small girl standing 20 1/2 inches tall but lightning fast. She lived for agility and especially the weave poles! She obtained her CPE championship title - CS-ATCH - in October 2013 at the age of 12 1/2! Although she had severe arthritis in one hind leg, she still enjoyed going to the training building and running 8" jumps and the tunnels!